Twinkling green lights fly like dancing fairies. The forest becomes a magic world when fireflies fall down as the night has approached. Fireflies in Hemai Mountain, Bitan. Fireflies are sensitive to environmental change. With modern housing and public infrastructure projects spreading out in recent decades, fireflies become fewer and fewer. For many adults, fireflies is in the deep memories of childhood. For kids, fireflies maybe live in illustration books. 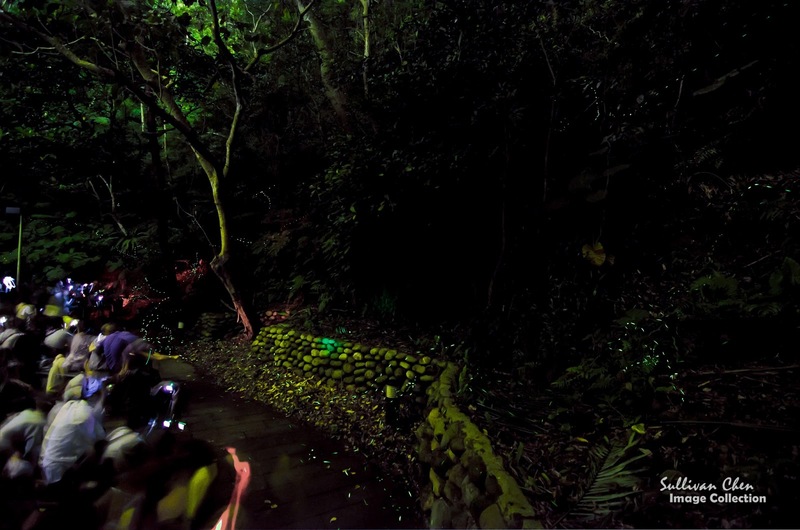 In Taiwan, there are still some many places that people can enjoy the magic power of the green lights. Dongshih Forest Recreation Park (Taichung), Carp Lake (Hualien), Wulai (New Taipei City) and etc. are famous for fireflies (For more information about watching fireflies in Taiwan, please visit Taiwan Firefly Tourism). However, it is difficult to access fireflies by public transportation. Because the habitats of fireflies are usually located in the rural area, people usually have to walk for a long distance to reach the habitats from the bus stops or train stations if they don't have their transportation tools. And the public transportation service is usually out of hours after watching fireflies. In fact, there is a place that you can enjoy watching fireflies without worrying the time and the transportation. The fireflies paradise located in Bitan, a attraction famous for its river view and suspension bridge. Bitan (meaning green lake in Chinese) is located at the terminal of MRT Shindian Station. The Shindian River runs through it, and the Bitan Suspension Bridge is erected over the river. Hemei Mountain is located at the east side of they bridge. The altitude of the peak of Hemei mountain is only 156 m. It takes about 2 hours to finish the trail. The nature of Hemei Mountain is protected well, and the biological diversity of Hemei Mountain make it a famous biological museum. Not only fireflies, but also frogs, butterflies, Muller's Barbets are popular here, not to mention the planets. 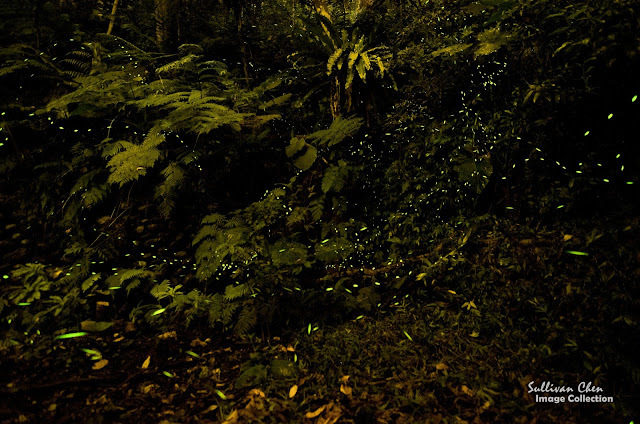 There are over 50 species of fireflies in Taiwan. The major species in Hemei Mountain is Luciola filiformis Olivier, which is about 8 mm in length and prosperous in April. Luciola curtithorax Pic is about 6 mm in length and prosperous in May.For more introduction about the species of fireflies, you visit the firefly.org. If you visit Taipei between April and May and are interested in watching fireflies, you should not miss the fireflies. You can contact the the local biological protection group. They provide the latest information of the fireflies. They also provide free fireflies tour guide, usually in the Friday or Saturday evening. The starting hour and place is not fixed, depending on the season. You can arrive Shindian MRT Station in the evening, You can enjoy the gourmet at the night market, in front of the MRT station, or by the river bank before the firefly tour guide. 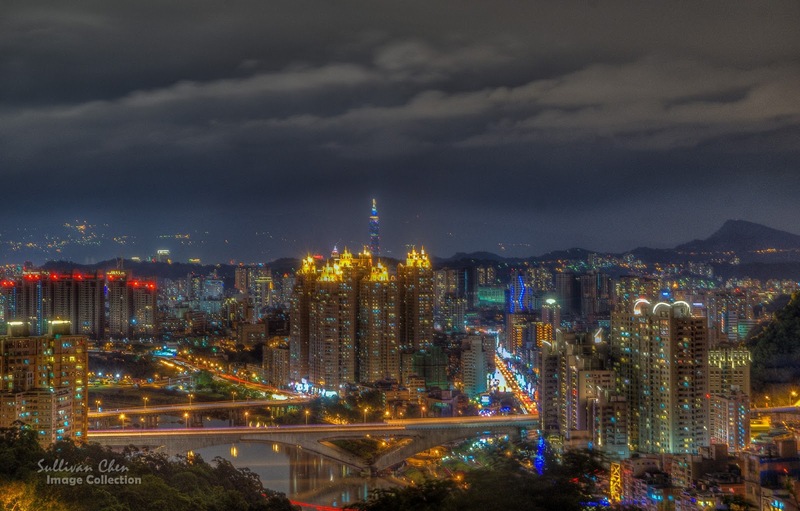 The tour guide usually gathers at the west side of the suspension bridge takes a rest at the peak of Hemei Mountain where you can see the night view of Taipei Basin. Bitan is located at the terminal of MRT Shindian station. The last train from Shindian Station is 12:00 pm. If you have to transfer, please leave earlier. 1. If you want to bring a flashlight, please cover the flashlight with red cellophane. 2. Walk on trail and do not step into the forest because the larvae of firefly live underground.